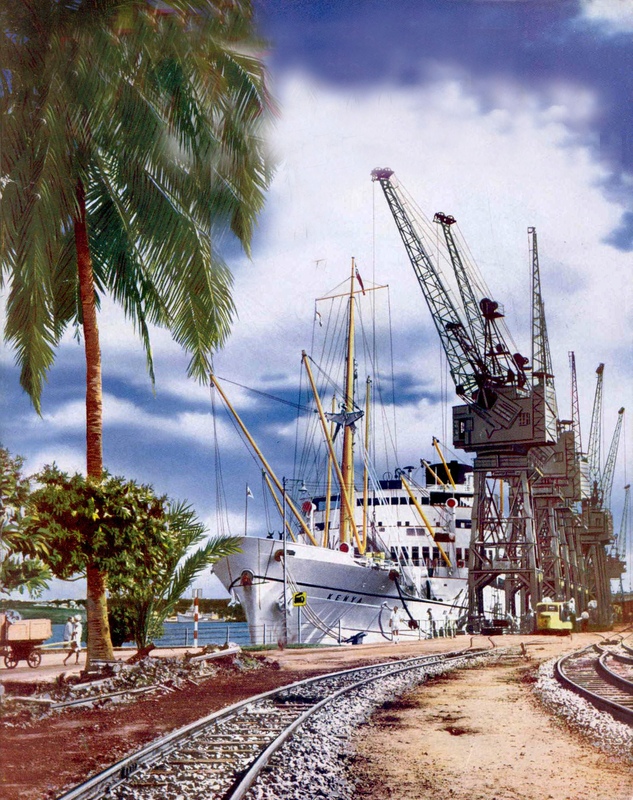 Of trains and cranes, an artist’s problem; my ‘team’ of investigators are gradually establishing what the wharves of port Kilindini, Mombasa looked like in 1951. 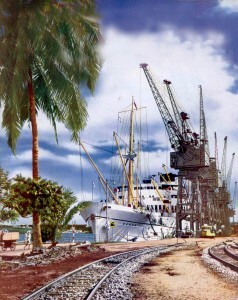 Did trains operate on Kilindini wharf circa 1951? We don’t have a date for this photo, it’s about right thought, and in a hot climate there is less rust more dust, the latter settles rapidly. My intuition is the trains were running in 1951 on those tracks. We know and have seen old, unused tracks fill in rapidly if set in cement as shown on the Kilindini wharf. The track groves appear deep which suggests to me the tracks were being used. David Mitchell pointed out “the train track in Mombasa is meter gauge and it doesn’t look as though anything has run on it for some time in your photo“. I agree with David the train tracks don’t look over used. Since then I’ve been able to confirm by photographs and about 4 minutes 15 seconds into a Pathe news film on Utube ‘Gateway to Kenya 1953‘, there were trains on the wharf at that period. We have pictures of the wagons but still no confirmation of the type of engine. The engines may have been tank engines like ‘Tomas the Tank Engine’, 11 class tank engines have also been suggested. In part we are certain there were steam engine trains on the wharf because a yarn t by one of the officers present for B I Sunday recounts an amusing tale that includes an engine.